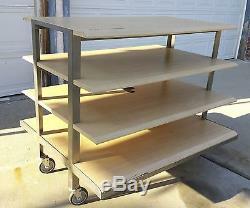 4 Tier Heavy Duty Retail Display Table with Casters. 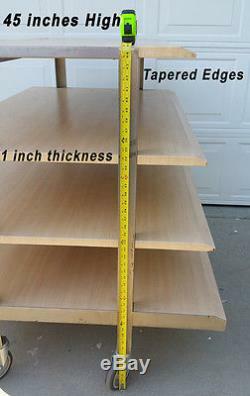 Top 3 shelves are 1 inch thick, bottom is 2.5 inches. 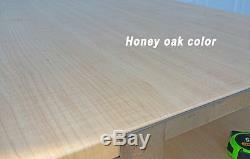 Light Honey Oak laminate color. 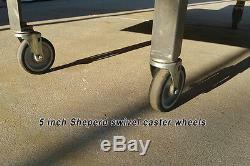 5 inch Sheperd swivel caster wheels. 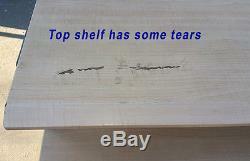 Top shelf- 30.5 x 51.75. 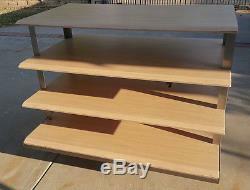 2nd shelf- 35 x 51.75. 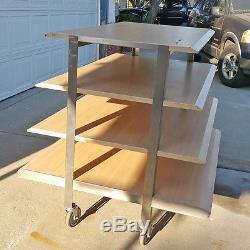 3rd shelf- 39 x 51.75. Bottom shelf 44 x 52. Overall Height is 45 inches. Height between shelves is 9.5 inches each. Item is Used, in good condition. Does show signs of wear. Top shelf has a couple of tears. Bottom shelf has some dents and knicks. 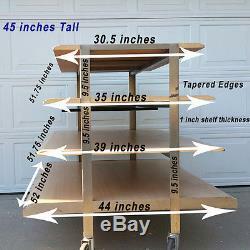 Great table for displaying your merchandise or use it in your walk-in closet or garage. It has wheels so it can go anywhere and be moved easily. Put bins, boxes, shoes, clothes, tools, just about anything. You could also cover it with paper, fabric, or paint to match any decor or design scheme. Message me with any questions or for additional photos. The item "4 Tier Rolling Retail Waterfall Display Table Heavy Duty 45 H x 52 W withCasters" is in sale since Friday, July 08, 2016. 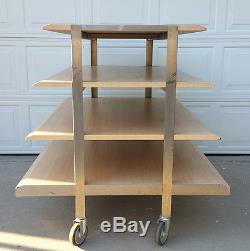 This item is in the category "Business & Industrial\Retail & Services\Racks & Fixtures\Other Retail Racks & Fixtures". The seller is "lucinda7779" and is located in Sun Valley, California. This item can't be shipped, the buyer must pick up the item.